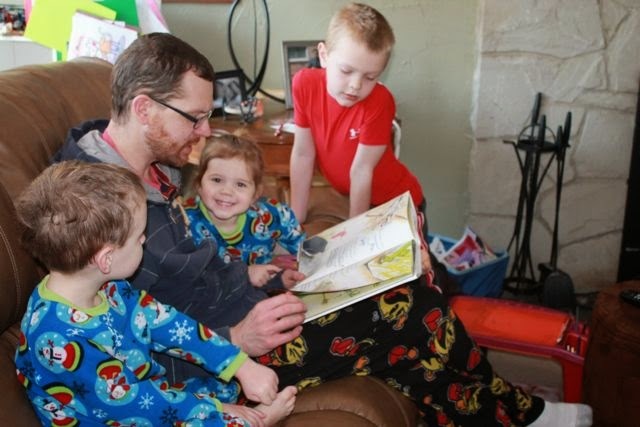 February is my toughest month as a stay-at-home parent. The kids have been cooped up for four months and they just want to play outside (and I wish they could, too, especially after dinner!). Their frustration becomes my frustration. Numerous times this week my children have said, "When will it be warm enough for us to go out to play?" We can't wait for spring! The one good thing about February, as I try to be positive, is that it is followed by March. This year, March will probably still be cold and snowy since February was one of the coldest on record. But, it feels good to have March here. Winter is almost over, college basketball will be heating up, and we have planned many author and illustrator birthday celebrations! Susan Stevens Crummel is the author of over a dozen books for children including The Great Fuzz Frenzy, Jackalope, and Ten-Gallon Bart. She became a children's book author after thirty-one years as a math teacher. 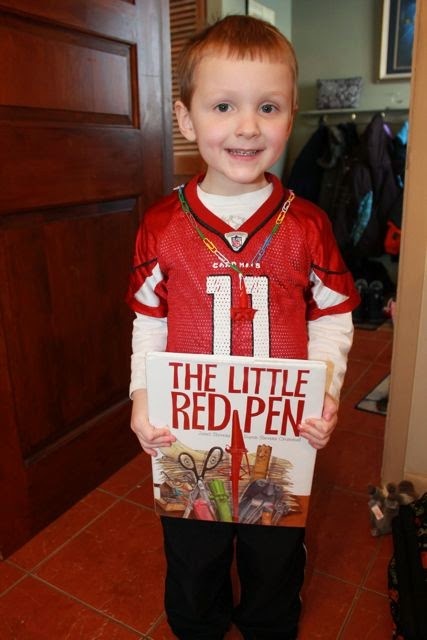 Her sister is illustrator Janet Stevens of the Caldecott Honor book, Tops and Bottoms. Susan and her sister talked about collaborating on books, but it wasn't until Janet needed Susan's help that it actually happened. 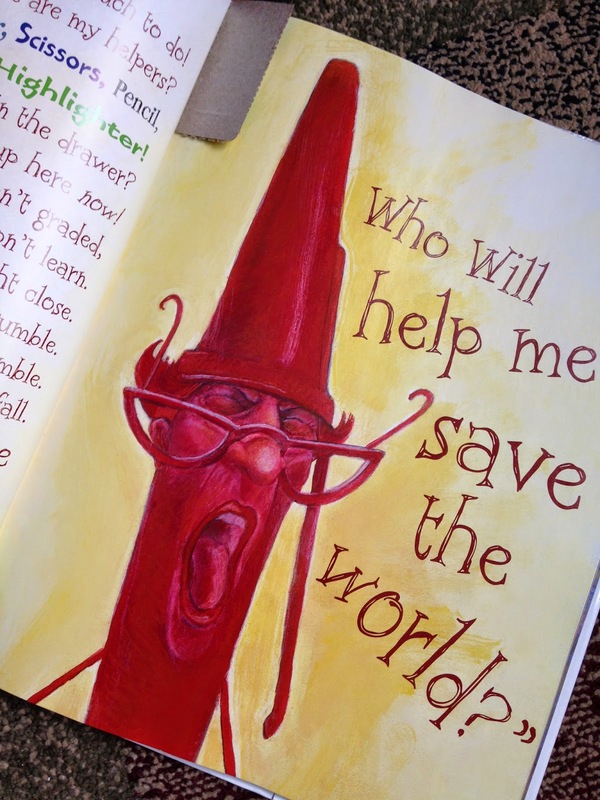 "She was asked to write and illustrate a story for a Harcourt School publication and the deadline was rapidly approaching. She knew what she wanted to draw -- she just was stuck on the how to word it. I became her voice; and in that week of brainstorming, writing and rewriting, we discovered that the collaboration was purr-r-r-fect." (Holiday House). The Stevens team has collaborated on 10 books together. Susan is often asked how their collaboration works, "Janet will say 'I have this idea,' and I put it down on paper and send it to her. She prints it out and writes all over it and faxes it back. I incorporate her ideas, and then at some point she starts drawing. We have different kinds of brains but the same sense of humor." (TCU Magazine). 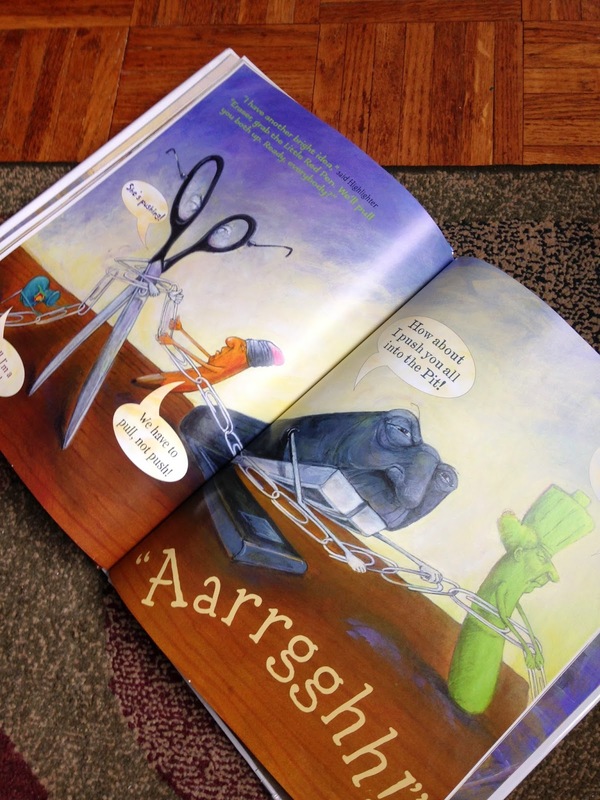 Together they have created many award winning books including Help Me Mr. Mutt: Expert Answers for Dogs with People Problems, a 2008 Time Magazine Top 10 Children's Book and Cook-a-Doodle-Doo, a 2001 Texas Bluebonnet Award winner. In fact, their books have won so many awards Susan has a page on her website listing all of them! My children have had many days of school cancelled this winter because of below-zero temperatures and dangerous wind-chills. One night this week after dinner, we received a phone call from the superintendent cancelling class for the next day. I immediately went into survival mode. "What am I going to do with all four kids tomorrow?" 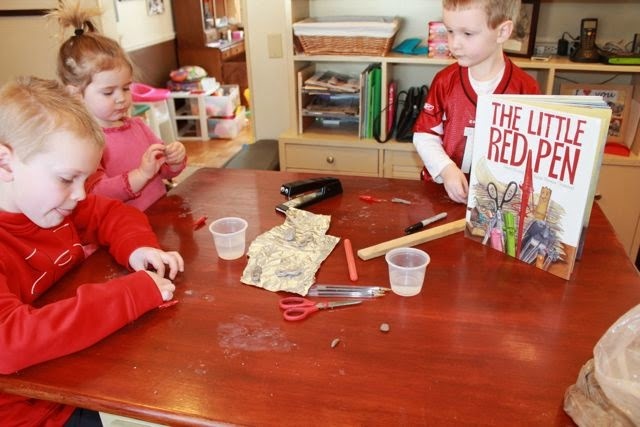 I started to play around with an idea for an activity for one of our favorite books, The Little Red Pen. It wasn't my intention but my tinkering and planning in the kitchen got my children quite excited for the next day's activity. I was just thinking, "I hope this works!" They were up early despite having no school. They brought me The Little Red Pen as I got out of bed and asked me to read it to them. 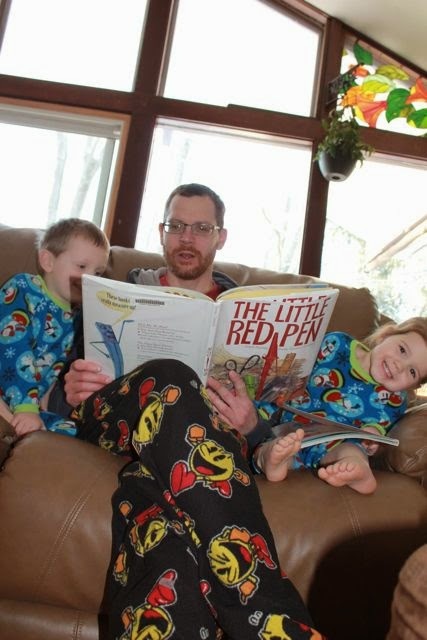 My Pac-man jammies prove that I am not making this up. I was reading this book before 8am! 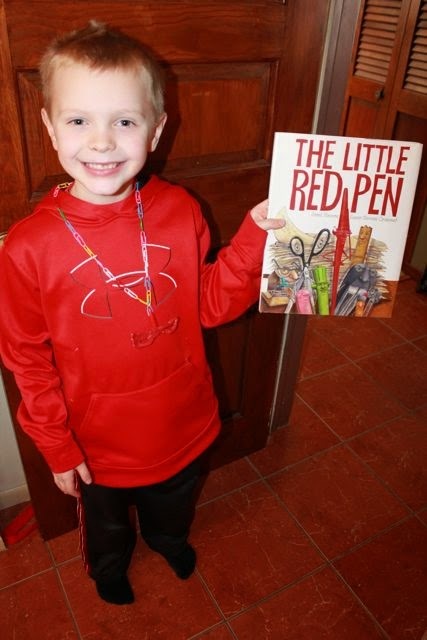 The Little Red Pen was inspired by Susan Stevens Crummel and Janet Stevens' editor because of her tendency to leave red marks all over their manuscripts. 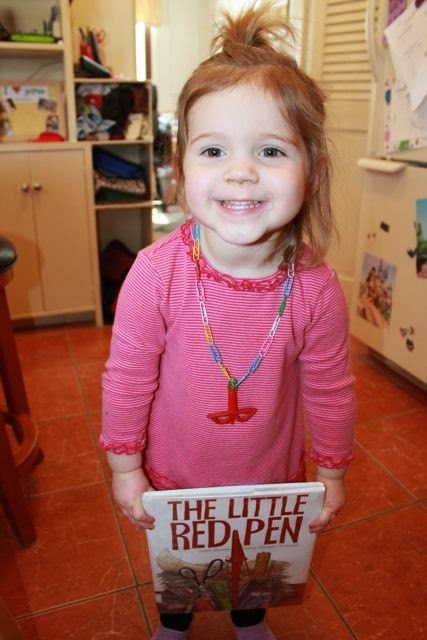 "We started calling her 'the little red pen' years ago. We made up a little story similar to THE LITTLE RED HEN and would tell it at reading conferences. Finally we turned it into a book. (Mom Colored Glasses). The illustration above shows the desk supplies using their paper clip chain. 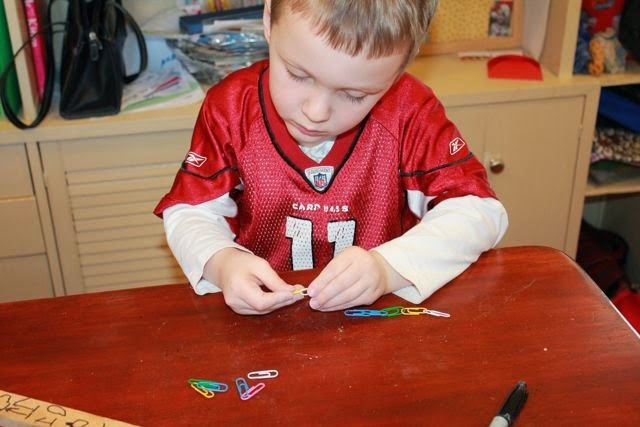 I thought, "I wonder if my children would like to make paper clip chains. Maybe we could make paper clip chain necklaces." 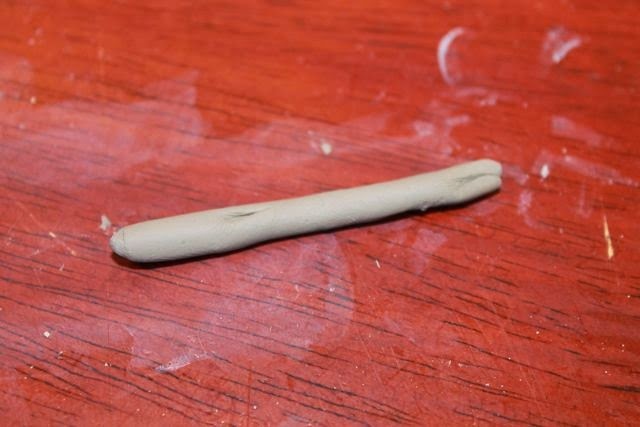 I rolled a thin piece of clay. 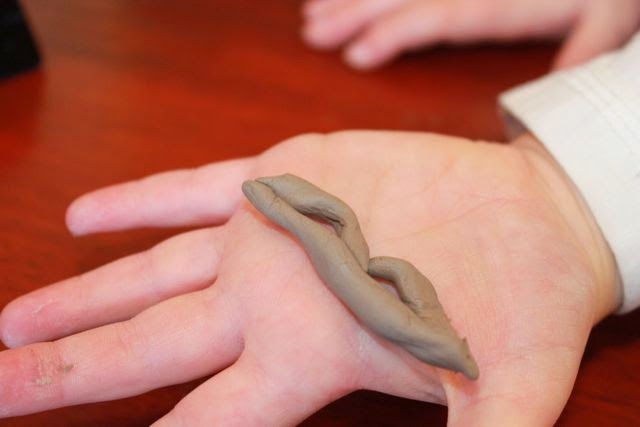 Then, I rolled two shorter pieces of thin clay and bent them into a curve. I pinched all the pieces together to look like glasses. I smoothed out all the creases with a little water and baked the glasses in the oven on the "broil" setting for about 5 minutes. After that I had glasses that looked like Red Pen's! 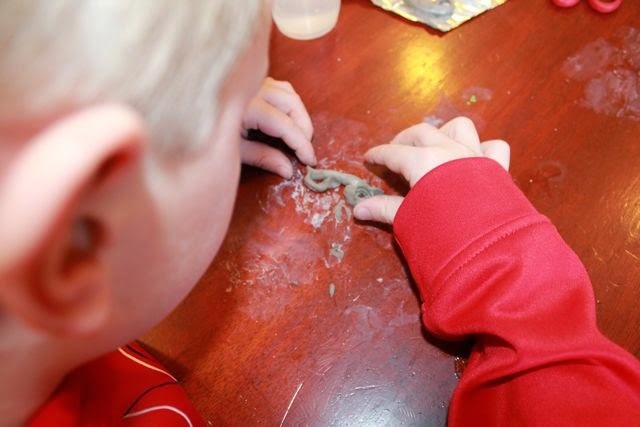 I was happy with my experiment and my children were very intrigued. I was ready for the next day. We changed our clothes shortly after reading the book in our jammies and then we were ready to start our Little Red Pen jewelry project. 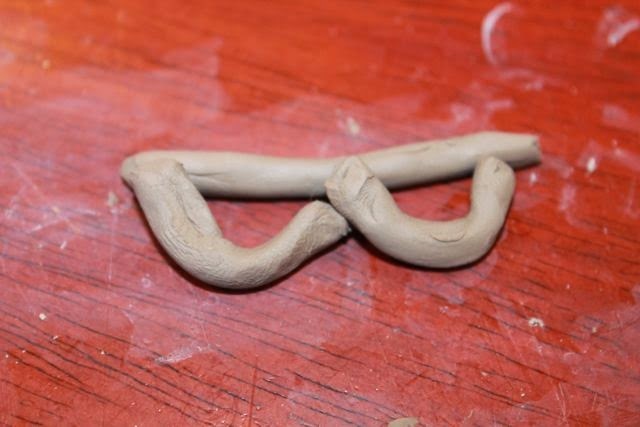 They rolled and shaped their clay to make glasses. 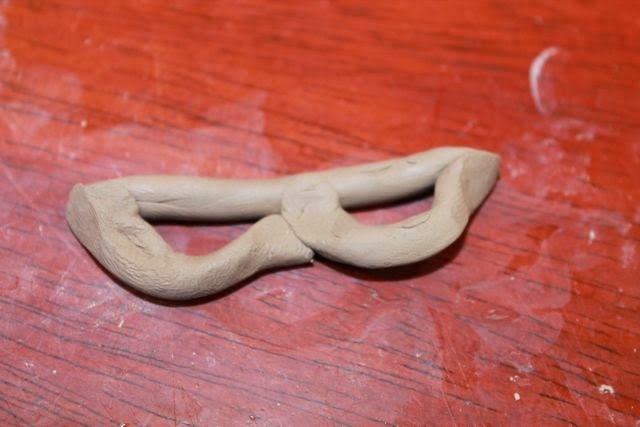 I was surprised with how quickly and easily they formed the clay into glasses. I asked them to make more than one pair of glasses, and then they could pick their favorite one for their necklace. This also helped ensure there were enough if they broke or didn't dry correctly. 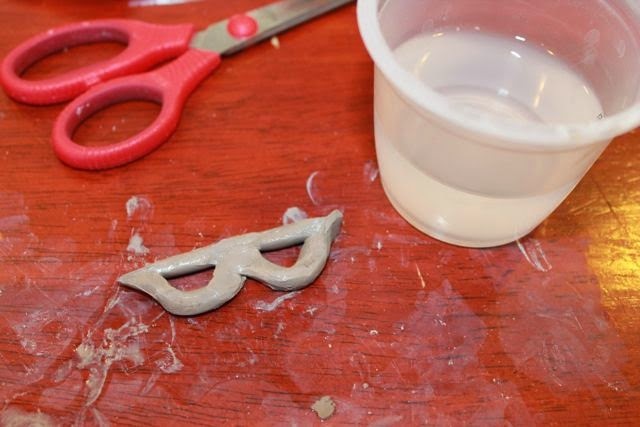 Once the glasses were formed we started working on the paper clip chains. Luckily, the night before, my wife was running to the store and she picked up some colorful paper clips for our necklaces. After some initial frustration, they figured out how to make a paper clip chain. 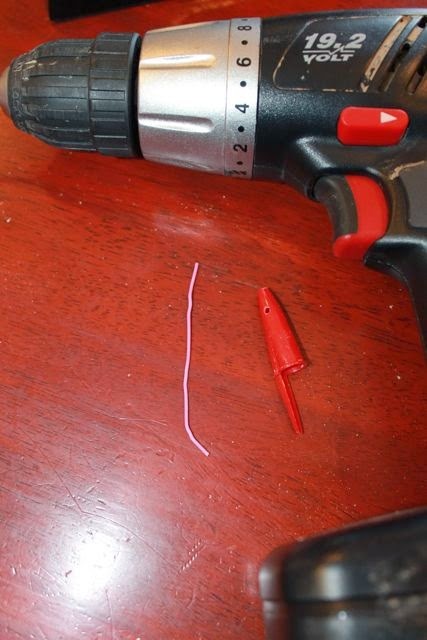 While they were working on their paper clip chains I drilled a small hole in the red pen caps. (My wife picked up the red pens at the store, too. This craft cost only $3!). Next, I unfolded a paper clip and fed it though the hole. 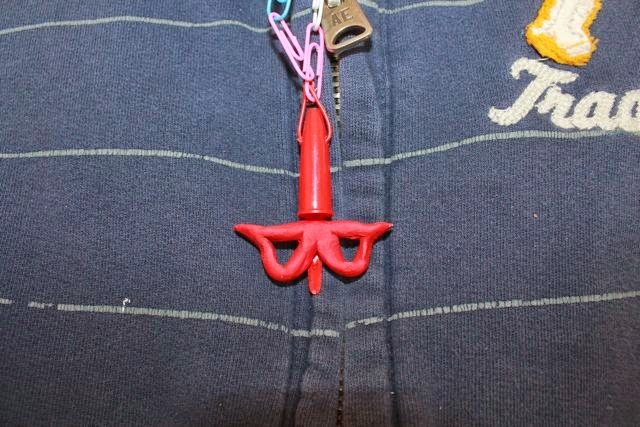 This would connect the Red Pen charm to the paper clip chain. 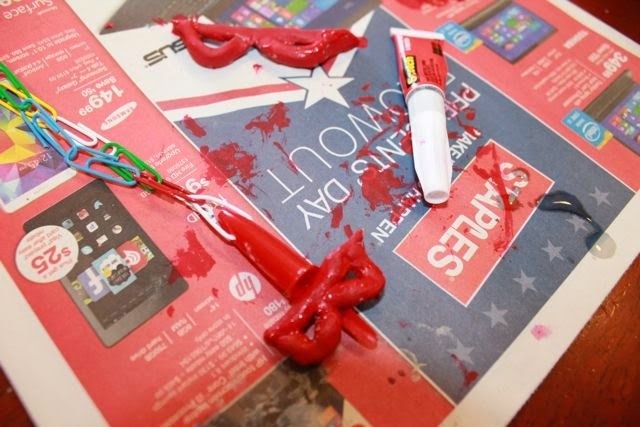 After the paper clip chains were made and the glasses were baked and cooled, my children painted them red. 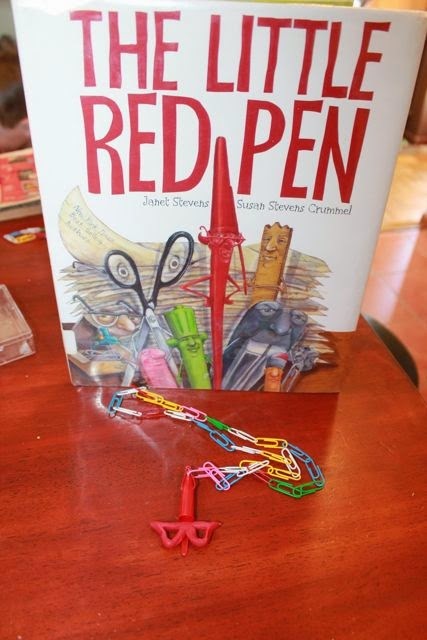 Then, I attached the pen cap onto the necklace by twisting the unfolded paper clip. The red glasses were then super glued onto the cap. Check out the Little Red Pen bling! He was quite proud of his necklace. 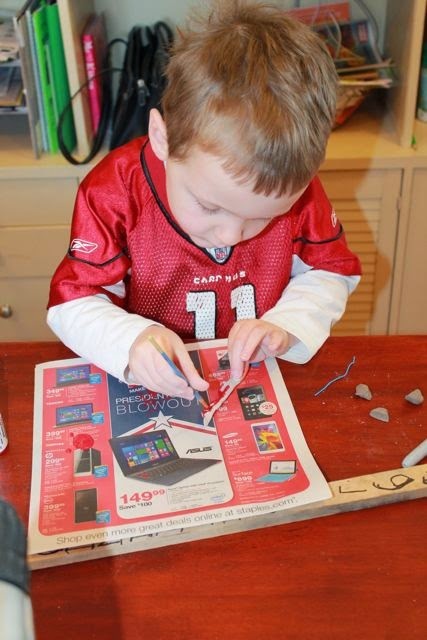 My son made a large pair of glasses and the super glue did a great job holding it on. (He was worried!) I did try other glues (hot glue and white) and they did not work. "Stick" with the super glue! This was a fun way to spend the morning of a day of school. However, I am hoping our school cancellation days are through and that March will bring us warmer weather!